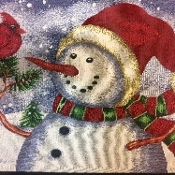 Create some holiday cheer for your home with our SNOWMAN TAPESTRY PLACEMAT. It’s the perfect Christmas novelty or holiday touch for decorating any kitchen or dining room table, wall, door or pillow to cheer the winter doldrums. The seasonal design is an adorable snowman with classic carrot nose, Santa stocking cap and scarf. Includes a cheery red Cardinal perched serenely on his own pine tree branch arm. Handcrafted look old world style traditional rectangular shaped tapestry style panel decorates your home with country flair. Also makes an elegant wall hanging, door décor or sewing crafts panel project to add to a pillow case cover or tote bag.